4 bedrooms, 2 bathrooms, living room, dining room, kitchen, ceiling fans, single carport. MW, DW, W/D, 4 Cable TVs (One is Widescreen TV), DVD, WiFi/DSL, NO PETS, NO SMOKING. BEDS: 1 King, 2 Queen, 2 Single. Accommodates 8. Everything was as described on website. This home was comfortable and accommodating for our family. We enjoyed the wildlife in feeding in the yard. The location was peaceful and quiet but still able to hear the ocean in the evenings. 6 people, 4 bedrooms, this house worked well for us. Nice living room, 55" TV and good internet. King mattress needs replacing. Overall the place is looking a little tired and the kitchen needs a remodel. John & Mary Ann C.
This is a lovely place to stay when visiting Jekyll Island. 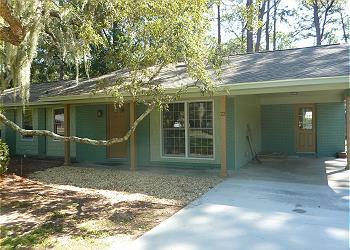 It is located on a quiet street a short distance from the beach and golf courses. Lots of opportunities to observe wildlife in the backyard. Excellent accommodations. Personal assistance service above and beyond. House large and clean. Appliances modern and the people and wildlife are extremely friendly.